At Strategic Wealth Management, our goal is to bring clarity to your future and help make your current life easier. That’s why we’ve pioneered a uniquely collaborative approach to wealth management. By harnessing each of our individual strengths, we are able to deliver customized, comprehensive care that helps minimize your stress and maximize your results. Wealth is complicated. We’re not. Our rules-based investment process is engineered to avoid common investment mistakes by eliminating emotional bias and conflicts of interest. Working closely with TD specialists and liaising with your trusted advisors (lawyers, accountants, family members, etc. ), we will coordinate a wealth strategy that encompasses your various needs. *The services of the Private Giving Foundation, an independent, non-profit charitable corporation, are offered in co- operation with TD Wealth. 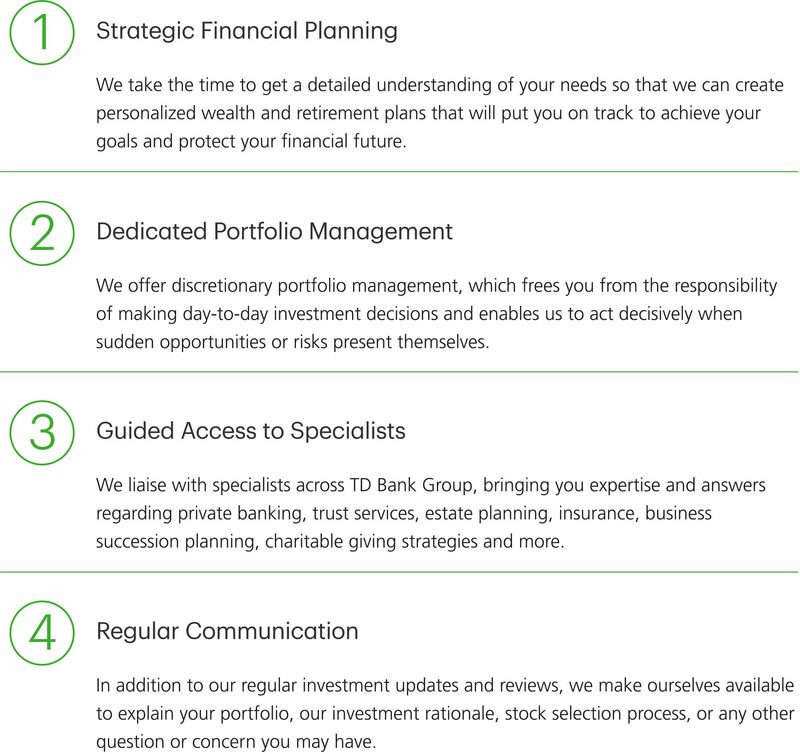 Strategic Wealth Management is a part of TD Wealth Private Investment Advice, a division of TD Waterhouse Canada Inc. which is a subsidiary of The Toronto-Dominion Bank.